Bidspirit auction | PRIDEAUX, HUMPHREY. 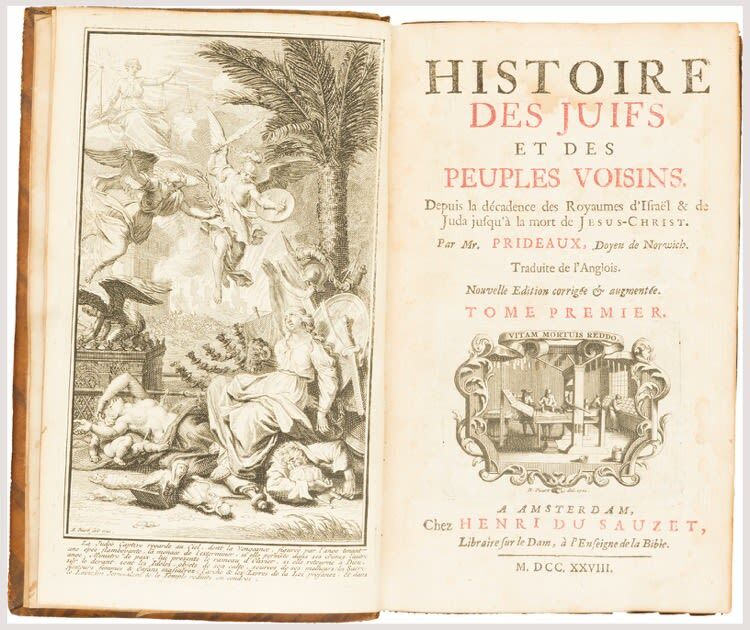 Histoire des Juifs et des Peuples Voisins. Six volumes. Illustrated with frontispieces and numerous well-preserved fold-out maps, plates, charts and tables. Lightly browned in places, few edges touch worn. Handsomely bound in contemporary uniform speckled calf, spines gilt extra, lightly rubbed and bumped at extremities. 12mo. Amsterdam: Henri du Sauzet, 1728. Revised edition of this French translation of “The History of the Jews and Neighbouring Nations” by the English Orientalist and Hebraist, Humphrey Prideaux (1648-1724).